Hannah Farrell is an American Artist currently studying animation at Minneapolis College of Art and Design. 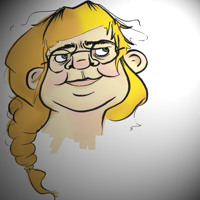 She is influenced heavily by French animator, Sylvain Chomet, who introduced her into the beautiful art of characters. Hannah is very playful with the bodies she creates and looks forward to the transition from still picture to moving picture. That being said, Hannah has been very happy as a freelance illustrator. She doesn’t know where her art career will go in the next few years, but she’s enjoyed it so far and is nothing but optimistic.